offers a solution to a wide range of mixing problems. Designed for intensive mixing, dispersing, kneading, and deaerating products such as adhesives, sealants, light caulks, pastes, coatings, granulations, and similar products of medium to high viscosity. V-Blenders designs are most often used for the intimate dry blending of free flowing solids. The solids being blended in these units can vary in bulk density and in percentage of the total mixture. Materials being blended are constantly being split and intermixed as the shell rotates. Normal cycle times are typically in the range of 15 minutes, however can be less depending on the difficulty of blending. V-Blenders are in 5, 10, and 15 liter or large size. capacity. Each is constructed of type 316-stainless steel and is internally polished to a 240 grit sanitary finish. The exterior is polished to an easily cleaned 150-grit finish. All V-Blenders are supplied with Intensifier bars to permit deagglomeration as needed. Discharge is accomplished through a manually operated Butterfly valve. The valve is positioned 24?from the floor when in the bottom position. All units are provided with appropriate safety railings and appropriately interlocked safety interlocks. Stop-Start and E-Stop Pushbuttons are included with all blenders. 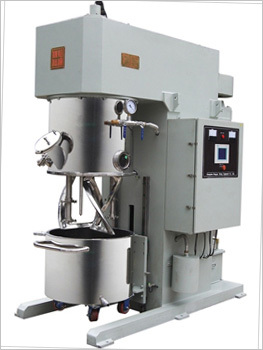 The Hydraulic Discharge Press system is required to discharge product from mix bowls if the product is not free flowing and cannot be discharged by gravity. Hydraulic Discharge Presses are an essential accessory for the Planetary Mixer and in some cases for the Single, Dual, and Multi-Shaft Mixers. Utilizing this system, products can be easily packed into cartridges, can, pails, or drums. The Press enhances operator safety, reduces the risk of contamination or loss of product, and also saves time. High Speed Dispersers is designed for intensive high speed, high shear mixing and dispersing of products such as inks, paints, coatings, adhesives, sealants, various dispersions, and similar products of low to medium viscosity. The mixers typically consist of a single High Speed Shaft mounted in the center of the mixing bowl. The High Speed Blade is typically a “Saw Tooth” dispersing blade. Other types of blades, or multiple blades can be mounted on the High Speed shaft to meet customer’s requirements. The mixers are available in various sizes, with or without adjustable arms to hold the mix bowl in place, and hydraulic lifts.